"Sampath Speaking" - the thoughts of an Insurer from Thiruvallikkeni: brave soldiers risk lives to carry injured to safety & treated ~ not humans but ants ! story..
brave soldiers risk lives to carry injured to safety & treated ~ not humans but ants ! story..
Ants are social insects of the family Formicidae; along with the related wasps and bees, belong to the order Hymenoptera. More than 12,500 out of an estimated total of 22,000 species have been classified. Ants form colonies that range in size from a few dozen predatory individuals living in small natural cavities to highly organised colonies which may occupy large territories and consist of millions of individuals. Fire ants are a variety of stinging ants with over 285 species worldwide. They have several common names, including ginger ants, tropical fire ants and red ants. Set in the modern times, an elderly veteran visits the Normandy American Cemetery and Memorial with his family. Upon seeing one particular grave, he falls to his knees overcome with emotion. The scene then shifts to the morning of June 6, 1944, as American soldiers land on Omaha Beach as part of the Normandy Invasion. They suffer heavy losses in assaulting German positions defended by artillery and machine guns. Captain John H. Miller of the 2nd Ranger Battalion assembles a group to penetrate the German defenses, leading to a breakout from the beach. Elsewhere on the beach, a dead soldier is face down in the bloody surf; his pack is stenciled Ryan, S.
In Washington, D.C., at the U.S. War Department, General George Marshall learns that three of the four brothers of the Ryan family were killed in action and that the fourth son, James, has been parachuted somewhere in Normandy. After reading Abraham Lincoln's Bixby letter aloud for his staff, he orders that James Ryan be found and returned home immediately. Three days after D-Day, Miller receives orders to find Ryan and bring him back from the front. 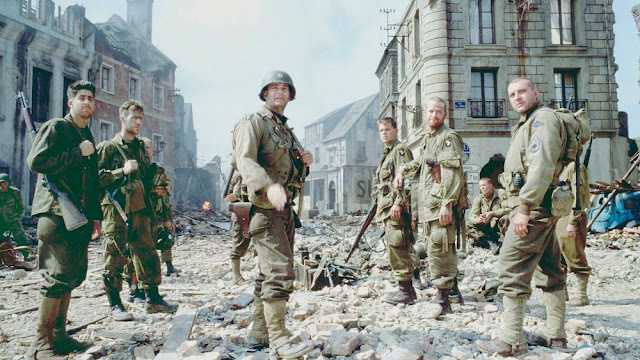 He assembles six men from his company— they move out to Neuville, where they meet a squad from the 101st Airborne Division, in pursuit, they eventually encounter a friend of James Ryan, who tells them that he is defending an important bridge in the town of Ramelle. Saving Private Ryan is a 1998 American epic war drama film directed by Steven Spielberg. M Set during the Invasion of Normandy in World War II, the film is notable for its graphic portrayal of war, and for the intensity of its opening 27 minutes, which includes a depiction of the Omaha Beach assault during the Normandy landings. The film received widespread critical acclaim, winning several awards for film, cast, and crew, as well as earning significant returns at the box office. It's a scene familiar from countless war films — the brave soldiers risking their lives to carry an injured comrade to safety, the noble casualty insisting they go on and leave him to die. But it’s not human warriors who act so selflessly. A study has shown that ants do exactly the same in battle. Live Science has this interesting article that a species of warmongering sub-Saharan ant not only rescues its battle-wounded soldiers but also treats their injuries. This strikingly unusual behavior raises the survival rate for injured ants from a mere 20 percent to 90 percent, according to new research published Feb. 13 in the journal Proceedings of the Royal Society B. These same ants, a species called Megaponera analis, were observed last year bringing their injured back to the nest, but no one knew what happened to the wounded ants after that, said study leader Erik Frank, a postdoctoral researcher at the University of Lausanne in Switzerland. Now, it's clear that the ants get extra TLC after being saved from the battlefield. M. analis is a nondescript-looking species that lives in colonies of several hundred to over a thousand ants. They're skilled raiders, sending out columns of several hundred ants to attack termite nests and drag termite corpses back to their own nests for a feast. These raids, however, often come with a cost: ants with lost or crushed limbs, or even ants limping home with tenacious termites clinging to their bodies. To find out the real happening, the researchers staged raids between the ants and captive termites, observing how the ants responded to heavily injured ants with five limbs crushed or amputated versus lightly injured ants with only two lost or damaged limbs. They found that in the vast majority of cases, severely injured ants were left to die on the battlefield. This version of ant triage wasn't at the behest of the rescuers, Frank said; instead, ants with five missing limbs flailed, rotated and generally refused to cooperate with their rescuers. Ants with two lost limbs, on the other hand, curled up into easy-to-carry balls and let themselves be taken home. "If you're able to stand up, you're very likely not too injured and you are still useful to the colony, so you should be able to call for help and be rescued," Frank said. Once back at the nest, healthy ants would attend to the wounded, licking their injuries for sometimes up to minutes at a time. Ants that were prevented from getting this treatment had an 80-percent chance of dying within 24 hours, the researchers found, whereas ants that were cared for had only a 10-percent chance of death. To find out what was killing the injured, untreated ants, the researchers relocated some to a sterile environment and found that only 20 percent died, indicating that infections are probably the biggest risk for injured ants. Any uninjured ant seems capable of providing the licking treatment — there's no indication of dedicated ant "medics," Frank said — but it's not yet clear whether the treatment prevents infections or actively treats them. Either way, the behavior is exciting to see because it's extremely rare to observe any individual animal treating another's wounds in any species, Frank said. It's especially counterintuitive in ants, because the tendency is to think that ant individuals are easily replaced cogs in the machinery of the colony, he said. But in M. analis, colonies aren't that large, and only a dozen or so baby ants are born each day, Frank said.